StarCraft 2 not only has single player and multiplayer games, it also allows custom games to be built. Blizzard gives everyone who owns StarCraft 2 access to a very powerful map editor which can be used to design many different styles of games. Most tend to be RTS type games but I've even seen things like Tetris recreated using falling supply depots. The map editor can be used to create a diversity of games. Sometimes these custom games become entirely new genres. 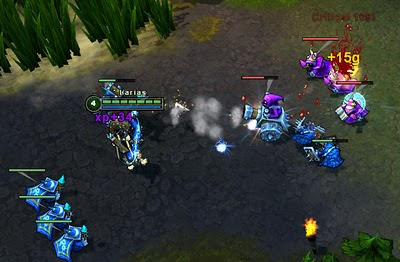 DoTA was created in the WarCraft 3 map editor and has since gone on to spawn League of Legends, Heroes of Newerth, and other games in the "battle arena" genre. In battle arena games you use an RTS control scheme but only control one hero unit. You are put on a team and face off against an opposing team of heroes. Both sides get minor AI controlled allies to fight along side them. If you liked DoTA I would highly recommend looking into League of Legends. It is my favorite battle arena game. Have you ever played a tower defense game? Guess where those were started. That's right, custom games within a Blizzard map editor. The "tower defense" genre is one of my personal favorites. In it you build towers to attack enemies. The overall goal is to stop them from moving from point A to point B. The enemies get stronger and you have to upgrade your towers to hold them back. In some versions you can use towers to create a maze that the enemies have to find their way through to reach the objective. Tower defense games are everywhere now. Go look at any flash game site and I promise you'll see at least one. I'm sure that there will be many tower defense and battle arena maps created using the StarCraft 2 map editor. It's been done before and people will want to refine and recreate their favorites. I'll play them and probably have a great time. But what I'm more interested in is the possibility of seeing another new genre emerge from the custom games in StarCraft 2. Something new and exciting that we've never seen before. The map editor and ability to play custom games online through StarCraft 2 is a great tool for innovation. I'm excited to see what comes from it.